Riley Children’s Foundation is honored to share an amazing milestone: Riley Dance Marathons have raised $50 million for Riley Hospital for Children! 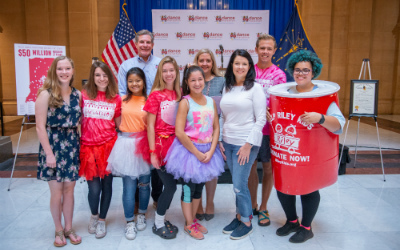 On September 25, Riley Dance Marathon students, along with Riley Children’s Foundation and Riley Hospital for Children leaders, visited the Indiana Statehouse where they were hosted by Riley Children’s Foundation Board of Governors member and Indiana First Lady Janet Holcomb. It was proclaimed “Riley Dance Marathon Day” in the state of Indiana. Since 1991, 115 Indiana high schools and colleges have participated in Riley Dance Marathons. To every participant, donor, school leader and Riley family who has contributed to this Legacy of Hope for Riley Hospital, thank you. Employs 24 Child Life Specialists who provide services on every inpatient unit and continue to expand their services to more outpatient clinics. To learn more about the Riley Dance Marathon program, visit RileyKids.org/DM.